With only one day in Seattle, here’s how I wisely spent my time. Seattle, Vancouver’s nearest neighbour, has long been a staycation destination for those of us seeking a city with a different flavour. 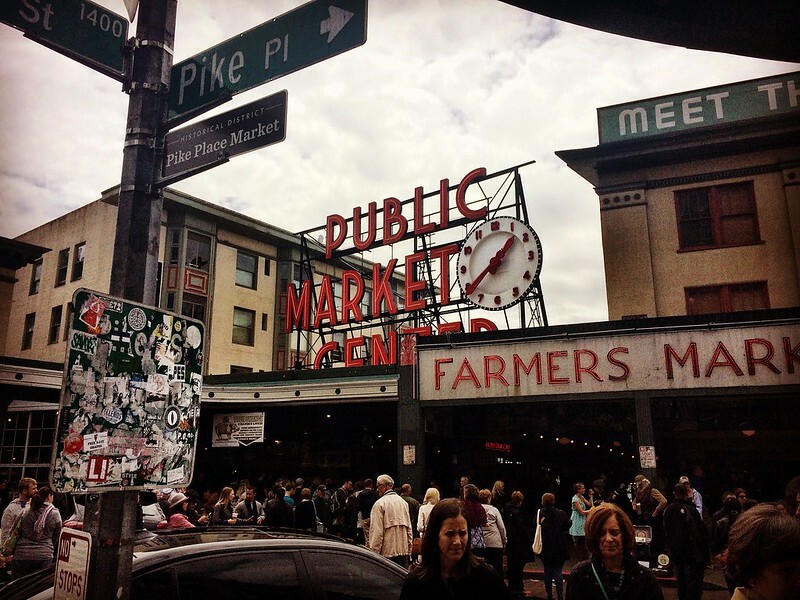 A weekend – or even a day – in Seattle is a common occurrence for Vancouverites. Being that it’s a quick hop over the U.S./Canadian border, escaping to the Emerald City provides a unique dose of culture that is decidedly and exclusively Seattle-esque. Spawning both grunge rock and Microsoft, Seattle is renowned for more than simply its inviting coffee houses. 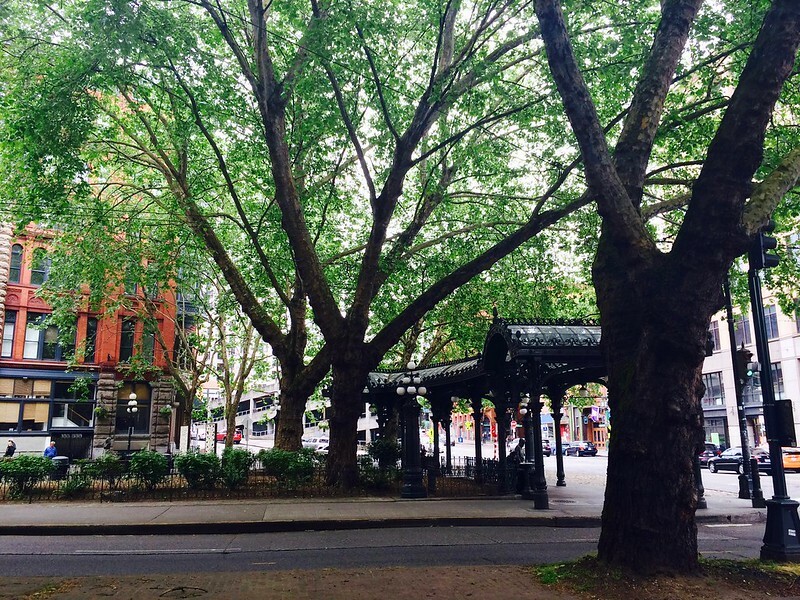 It’s also the heart of the Pacific Northwest, a city steeped in history. 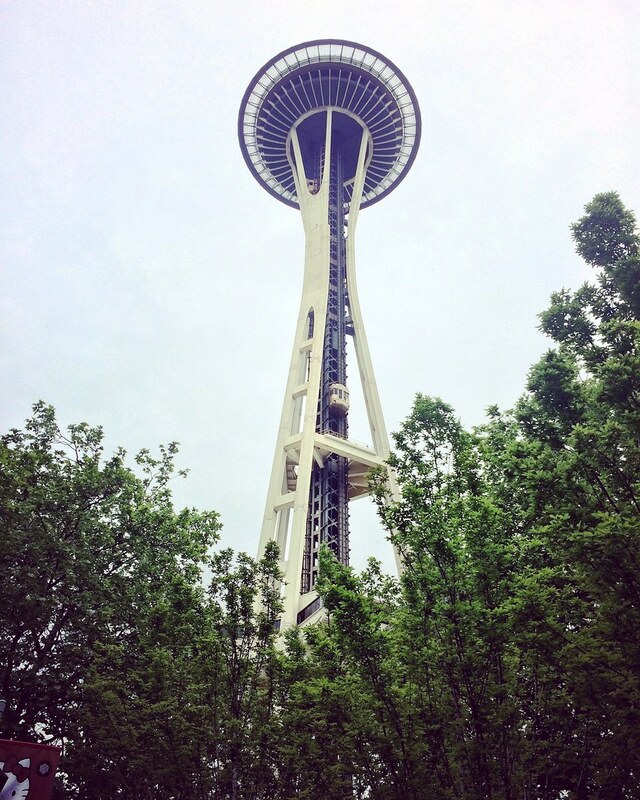 I recently had eight hours to spend in Seattle, and made sure to plan my time smartly. After a quick latte at Cherry Street Coffee House, I ventured underground with Beneath the Streets. Presenting the quirky and the creepy, this tour outfit explores the saga of Seattle’s past, starting with when European settlers first arrived in the area. Centuries ago, Seattle was comprised of incredibly steep cliffs giving way to tidal flats. These flats are underneath the neighbourhood of Pioneer Square, arguably the birthplace of modern Seattle. The city was initially built on these tidal flats, an unstable start to a shaky colonization. Much like Vancouver, Seattle experienced its own devastating a fire in the late 1800s, an inferno that decimated the entire city in just 12 hours. While the city was motivated to quickly rebuild, City Hall knew it needed to stabilize the tidal flats first. Because this process would take nearly 10 years of hauling earth down from the cliffs, merchants built an entire storey below the current street level, moving their storefronts up a storey once the land stabilization and backfill was completed. This left an intricate honeycomb of sidewalks, passageways, and former businesses preserved below the city’s surface. 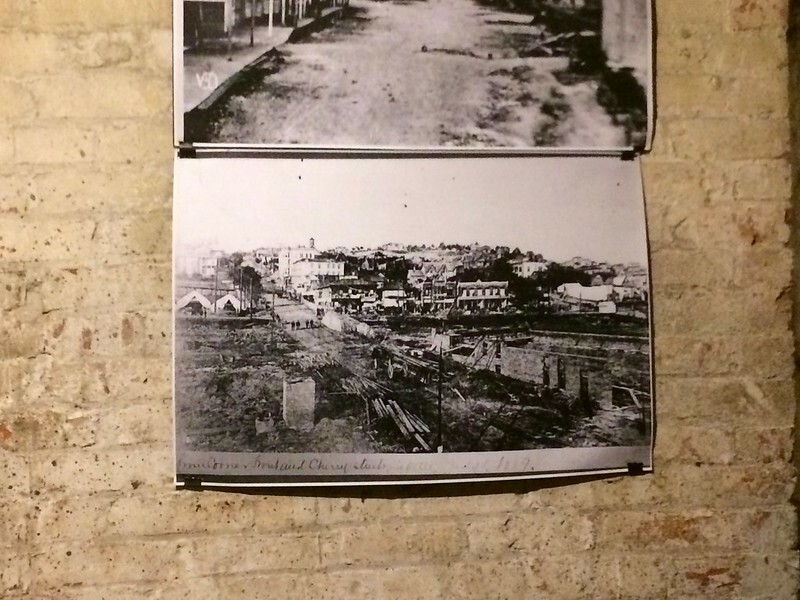 Once the city rebuilt, these tunnels were used for everything from illegal bootlegging to speakeasy joints. My tour guide expertly navigated us through the tunnels while narrating the stories that are vital to the city as it’s known today. Though largely dormant for decades – and even condemned for a while due to bubonic plague – the tunnels are now a vital part of Seattle’s history. Following the tour, I walked up to Westlake Center and hopped on the Seattle Monorail for my first-ever ride. A quick slide on the rails from there to Seattle Center, the monorail connects visitors to the Space Needle, Chihuly Garden and Glass, and the EMP Museum. Being the lovechild of Microsoft co-founder Paul Allen and his dedication to contemporary pop culture, this museum was something I’d been dying to see for years! As a child of the ‘80s and ‘90s, I grew up with the Seattle grunge sound and have been a huge fan of Nirvana for as long as I can remember. 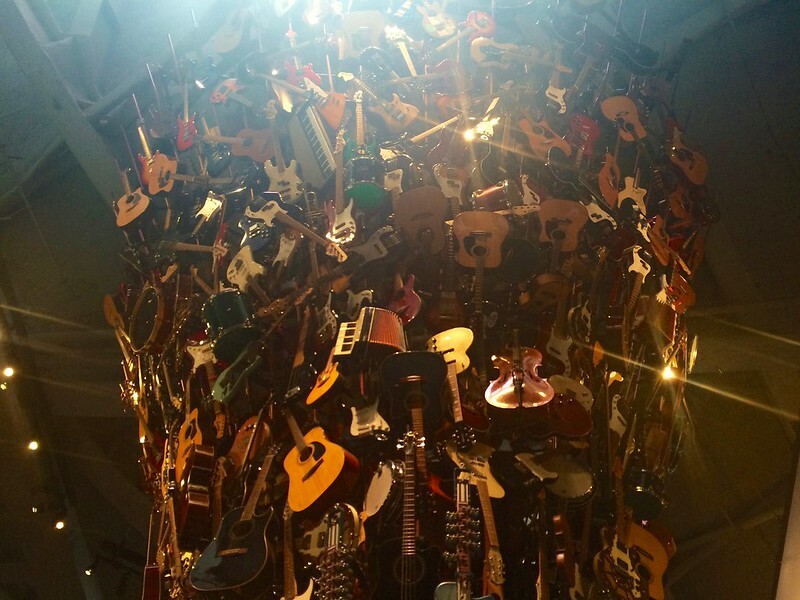 The EMP Museum houses the largest collection of Nirvana memorabilia in the entire world in their exhibit titled Nirvana Taking Punk to the Masses. Like so many others, I was devastated by the loss of Kurt Cobain. The void he left behind in the music world is still palpable, so I personally found it very touching to commemorate his impact through this exhibit. Old demo tapes, a four-track recorder, sweaters, handwritten notes, and some of Kurt’s favourite instruments are on display. 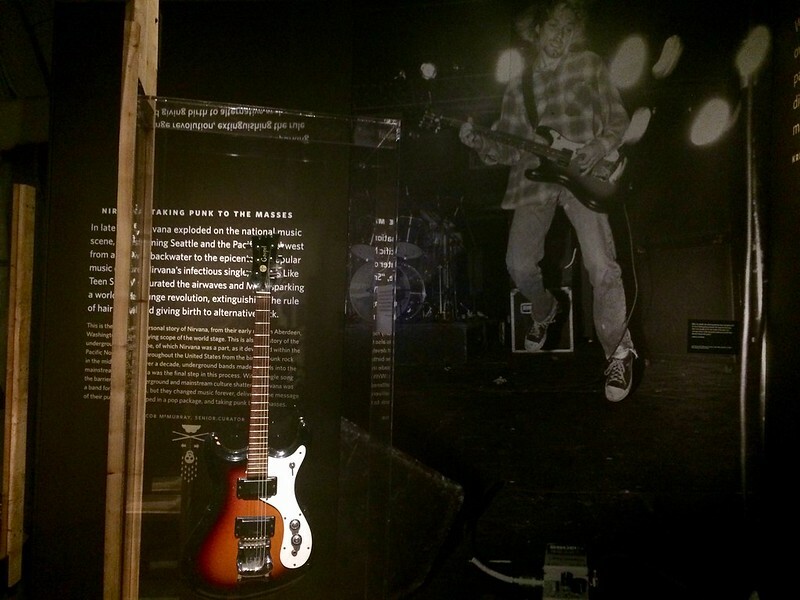 The “Seattle Sound” of the grunge era had a profound effect on music, and this exhibit poignantly reflects that. I also popped into Can’t Look Away: The Lure of Horror Film while there. I’m a huge horror movie buff, so I didn’t want to pass up on the chance to see Jack Torrance’s axe from The Shining or Shaun’s shirt and tie from Shaun of the Dead. Curated by Eli Roth, Roger Corman, and John Landis, it showcases some of the most notable horror movies throughout history and the artifacts they’re known for. Next door I found the science fiction exhibits, exuding a “woah – that’s cool!” factor with displays from some of my favourite childhood movies: Terminator 2: Judgment Day, Ghostbusters, and Back to the Future. Did I mention that Luke Skywalker’s lightsaber from Star Wars: Episode IV is also housed there? With my day winding down, I didn’t want to miss out on a quick visit to Pike Place Market. This iconic expanse on Seattle’s waterfront is a beehive of activity. Local fisherman hocking their catch, unique eateries with global-centric fare, and treasures like purple sugar, freshly-grown flowers, and locally-roasted coffee beans make this spot a can’t-miss. 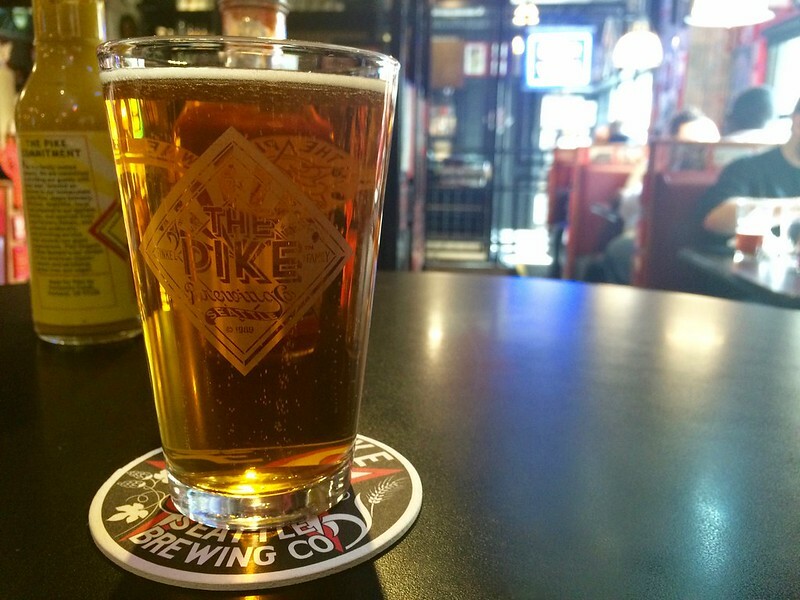 Hungry from my busy day of adventure, I settled in for a late solo lunch at The Pike Brewing Company. A family-run establishment, PBC has been creating craft beer that Seattle residents are proud to call their own since 1989. I opted for a locally-sourced burger and pint of seasonal ale before making my way to the bus depot. A city by the sea, not without its charm and an endless list of activities to do and places to see, Seattle can be conquered in a day or explored in a week or more. If given the opportunity, it’s definitely a place worth taking your time, and every visit I make leaves me wanting more.